This article continues the discussion of battery storage following from the previous article WHY INTERMITTENCY MATTERS, PART II: BATTERIES—OR, NOT. Two highly publicized operational wind farms use large battery storage to smooth out the jitters of power coming out of their turbines: Duke Energy’s Notrees facility in Texas, using “advanced” lead-acid batteries, and a similar project, Laurel Mountain, in West Virginia, using lithium-ion. Since you already know things about Notrees if you read Battery State-of-the-Art earlier, I’ll take Laurel Mountain first. Laurel Mountain wind farm’s storage facility, pictured above, was installed by AES Energy Storage, a division of power industry giant AES. It went on line in October 2011. The number of trailers parked at the facility should give you a sense of what a battery array for a modestly-sized wind farm looks like. For more pictures of AES Storage installations, check out: AES Storage Deployments. Thanks to an informative article by Matthew Wald in The New York Times, we know quite a bit about its launch in 2011: http://www.nytimes.com/2011/10/29/science/earth/batteries-on-a-wind-farm-help-control-power-output.html. Wald tells us "the installation is far too small to store a night’s wind production and give it back during the day when it is needed, or to supply power when the wind farm is calm for more than a few minutes. Instead, AES says, the battery will be a shock absorber of sorts, making variations in wind energy production a little less jagged and the farm’s output more useful to the grid." Wald quotes AES Energy Storage's VP on operations and deployment, John M. Zahurancik, on the rationale: "Rather than store power on a daily basis. . . the installation will earn its keep by storing energy for minutes at a time, over and over again." The storage gives the transmission service operator, far away at the nexus of many generators and many customers, some time to adjust for surges or losses. "In the space of an hour, the output from the wind farm could go from 98 megawatts to zero. 'In any short couple-minute interval, it could vary 20 or 30 or 40 percent,' Mr. Zahurancik said." Wind energy enthusiasts are encouraged to read those last two sentences again. For graphic representations of wind intermittency and variability, check out more links at the end of this article. They illustrate starkly the necessity for smoothing out the sharp swings in wind energy mentioned by Mr. Zahurancik—the necessity, that is, if you're going to depend on wind for a large share of your electric generation. There's a follow-up from AES a year and a half later. In April 2013, AES announced an "Energy Storage Milestone" at Laurel Mountain that boasted of a 98 percent "service factor" to the Regional Transmission Operator, PJM Interconnection (PJM). AES attributed this success to their “patented energy storage control system.” The "milestone" was that Laurel Mountain had supplied 400,000 megawatt-hours (MWh) of “regulation service” to that point. At first blush you might think, from all those megawatt-hours, that in a roughly 12,000-hour time span (taking the period from end September 2011 to end March 2013), Laurel Mountain had generated an average 33 MWh per hour—meaning a 34% capacity factor out of the 98 MW nameplate generation. But if you thought that—as I naively did at first reading—you might be wrong. You may notice in the press release that the storage capacity at Laurel Mountain mushroomed from 32 MW from the time of the overview, to 64 MW in the spring of 2013. Did they double the number of batteries? As Shelton has it, Laurel Mountain’s ostensible 32 MW battery array gets to be counted twice, for power both going into and coming out of the grid. This is what is meant by the cheerful 98% “service factor” that lifts Laurel Mountain’s battery capacity to 64 MW and contributes to the 400,000 MWh “milestone.” Hidden megawatts! And those hidden megawatts halve the per-megawatt cost of the storage facility. Not being a power engineer, I understand that Shelton’s case for “power plant equivalence” must have some merit, let others judge how much. 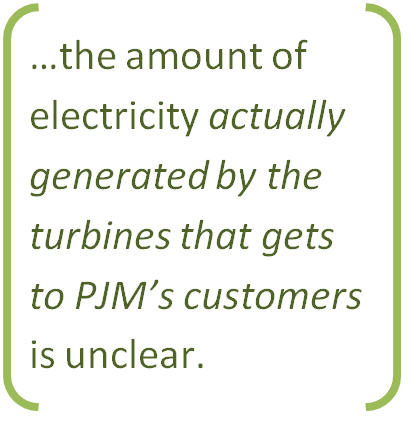 What I do know is that the amount of electricity actually generated by the turbines that gets to PJM’s customers is unclear. Does it follow the graph shown in their overview? If so, why is AES bragging about “regulation service” rather than generation? AES must know what the generation was, but they’re not saying. They’re into selling storage, not generation. If I were a proud wind turbine standing atop Laurel Mountain, I’d be a little sad, finding out my work is just a one-sixtieth part of a sideshow. Does it matter? Laurel Mountain is, after all, a pilot project. Throughout its entire 13-state system, PJM has more than 6,000 MW of wind generation installed. Laurel Mountain's nameplate 98 MW amounts to less than two percent of that. Furthermore, on the PJM site we find a pie chart showing capacity by fuel source, out of the 165,000 MW total over its service area from all sources, wind accounts for just 877 MW, giving under a 15% capacity factor. The reason that wind occupies so little area on that pie chart is explained in a footnote: "This amount of wind is not the total amount that is connected, but is the amount that we rely on, which represents approximately 13% of the total." PJM pie chart. You can see PJM is not putting many eggs into the wind power basket, although elsewhere on that site you will find PJM boasting about how much wind generation is installed on their grid. When a high pressure system with scant wind hangs over the PJM system for a few days, the impact on PJM’s operation is slight. 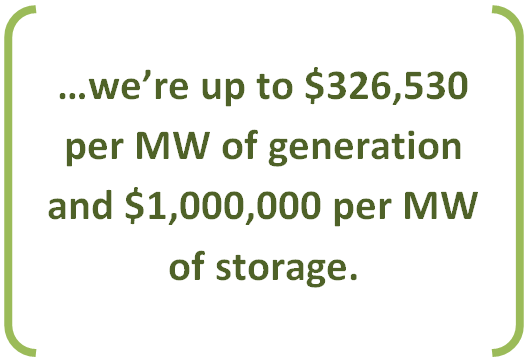 As for Duke Energy’s Notrees wind farm in Texas (another pilot project), the total cost of the storage per unit of power generation was proportionately about the same as Laurel Mountain’s, although Duke Energy got out of paying half of it, thanks to the matching grant. The cost per unit of storage came out worse. Perhaps it’s because they used lead-acid batteries, although they were advertised as “advanced” lead-acid. You cannot make a direct comparison with Laurel Mountain since Laurel Mountain is now counting “hidden megawatts”—and if you can count them for Laurel Mountain and not Notrees, then Notrees comes out a lot worse. Concerning its actual performance, Duke Energy is not making any public claims. Once they catch on to Chris Shelton’s method for calculating “service to the grid,” they might come up with a justification for the $44 million. There’s nothing in the “Performance” slot in the DOE record for Notrees except for: “Performance metrics not available.” See http://www.energystorageexchange.org/projects/11. Lesson Learned: The Customer May Be Right, Although Confused. How can we compare these two pilot projects? Unless you’re a skilled investigative reporter (not me) ferreting out the details, there’s insubstantial evidence to show which story has turned out better. Certainly AES Energy Storage’s PR efforts are top-notch. We can’t depend on DOE to be a disinterested party when there’s a government finger in the pie, as is the case at Notrees with the matching grant. What we need is a disinterested third party with some meaningful performance metrics—ways to evaluate such things as “hidden megawatts”—and report things such as (1) what wind-generated power is really coming out of Laurel Mountain and Notrees that gets delivered to customers; (2) what is the real value of the storage system to the service operator? Does the puny contribution of Laurel Mountain to PJM’s overall system—generation or storage, take your pick—indicate real potential for affordable, or even feasible, battery storage in the coming decades? Decades in which the renewable dream is for 100% of generation to the grid? Intermittency compounds the measurement problem, since the storage component adds to cost and complexity, obfuscating the payoff. It’s no wonder that Tesla’s Chief Technical Officer J.B. Straubel is biding his time on stationary storage. Should we all? Lastly, I recommend using Google’s Chrome browser to read and comment on this article. A much needed series on batteries. Thanks for the work and contribution, Mark! Excellent post! Very true, and important for people to know. This article would make better sense if energy units (MWh) were not repeatedly confused with power units (MW). For example, the references to 32 or 64 MW "capacity" appears to be incorrect. Also, the pie chart showing 13% reliable wind capacity is referring to exactly what it says. There is probably another 20% wind capacity which is "unreliable" in any given time period and the turbines return an average (say) 33% capacity factor. The 13% figure is not readily comparable with either the nameplate rating or the capacity factor - it looks like an operator's rule of thumb for use when selecting a power mix for the grid. Any available wind above that figure is essentially a windfall (pardon the pun) and be considered as a negative load. Excatly - they may have more wind power avalible, but it is avalible at times when it is not needed and cannot be stored. Ergo the power is spilled - sold to other utilties at a steep discount, dischraged to the ground, or the windmill is feathered so it stop generating. Your first paragraph underscores my overall message concerning intermittency. The industry hype typically blurs the distinction between power and energy, and that, I believe, is the source of the confusion. In the April 2013 press release AES went a step further with the claim of 400,000 KWh of "regulation service" in the same sentence with 98 MW wind generation and 64 MW battery storage. I am not clear on just what "regulation service" means, but one interpretation of Jay Shelton's remarks with graph in "Hidden Megawatts" is that the storage facility at Laurel Mountain could, in principle, be delivering heaps of "regulation service" to PJM even if the Laurel Mountain wind turbines were not operating at all. I apologize for not clarifying the distinction better. You are right that I misused the term "capacity" in at least one instance. I should have used Shelton's term "resource" in connection with the batteries, which is vague enough to cover a lot of ground. You make a good case on the 13% reliability versus actual (and unknown) contribution of wind indicated in the pie chart. However, your adverb "probably" says a lot. Also, PJM's wording under "Renewables Today" refers to "total generation," and then says "the chart shows installed capacity values." (You'll find that in the linked piece although not in the chart we inserted.) There's another ambiguity, but although I failed to account for potential 20% (or whatever) additional wind generation, I think the ambiguity illustrates the overriding problem of intermittent sources with their lack of both reliability and dispatchability. There are no asterisks in PJM's chart next to "Hydro" or "Nuclear". One of them is highly reliable and the other highly dispatchable. Wind is neither, and there's the danger of deep intermittent penetration without oodles of currently missing storage. You shouldn't feel bad - this is confusing on purpose. The simple fact that it IS consistently confusing tells you that may people are simply lying.